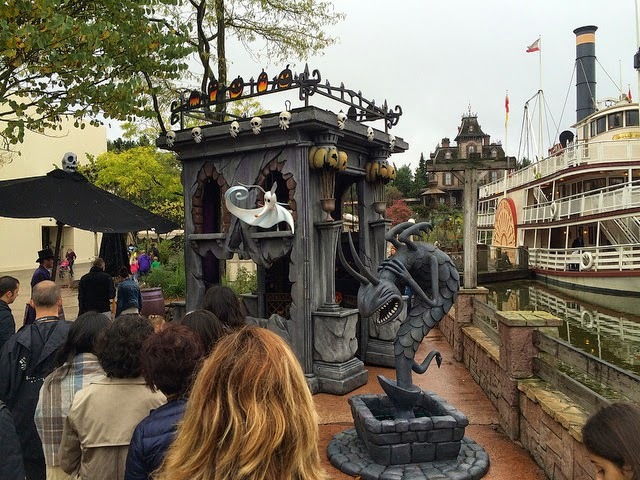 With at least a couple of weeks since my last visit to the park as a guest, I thought I should take advantage of my free admission to the parks to enjoy the 2014 Disneyland Paris Halloween season. 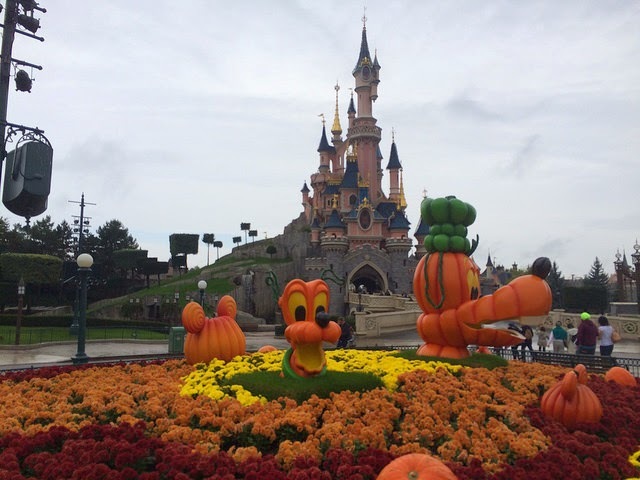 The Halloween season this year runs from the 1st October to 2nd November, and I visited just one week after it debuted. 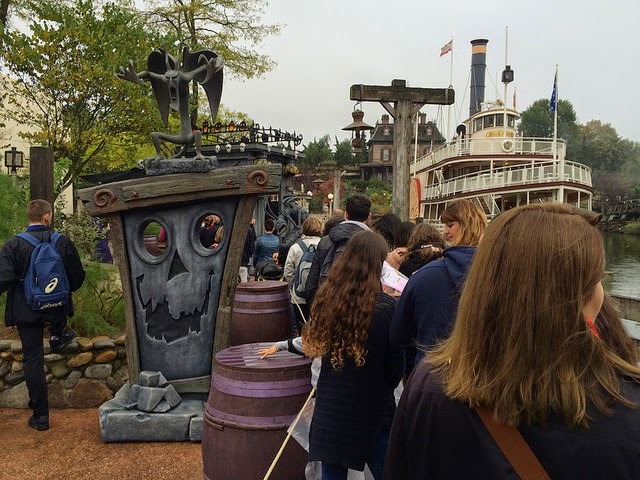 I visited with Margaux and we had strategically chosen to go on the 9th October as the kids were still in school and therefore we would have short waits for all the Halloween events. 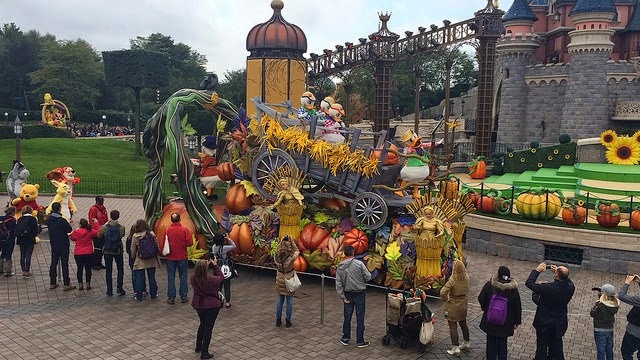 This year guests can enjoy a beautifully decorated park from the moment they step in. 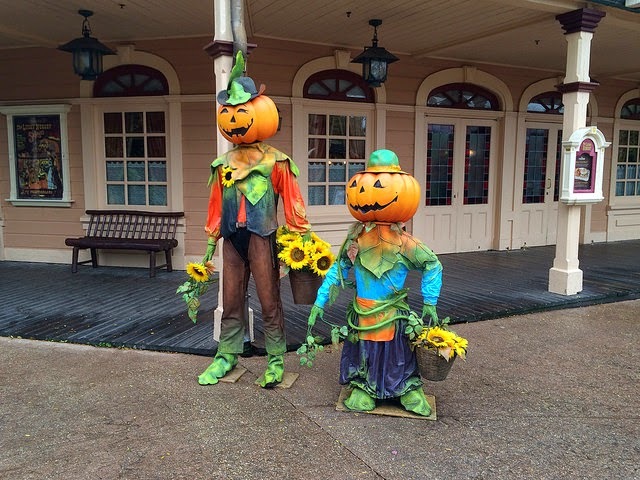 As you step onto Town Square and down Main Street USA, you can't help but notice the incredible effort that has gone into making the part Halloween-like. 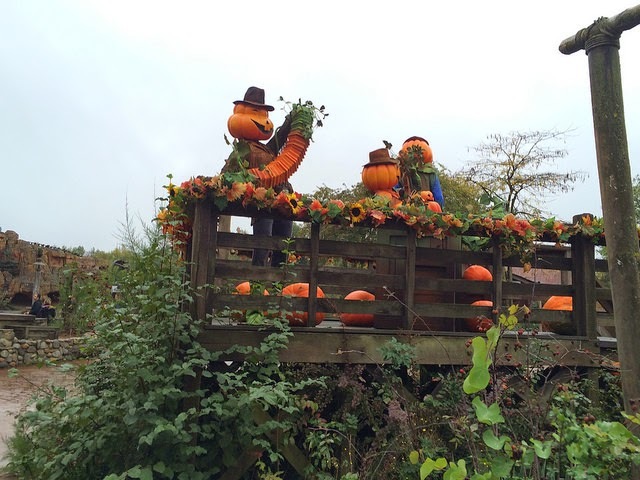 Orange is definitely the colour of the season and you can see Pumpkins in every direction you look as you walk in. It was equally nice to have a live band playing to add to the atmosphere, and all along the rooftops you can see ghosts themed to their environs. 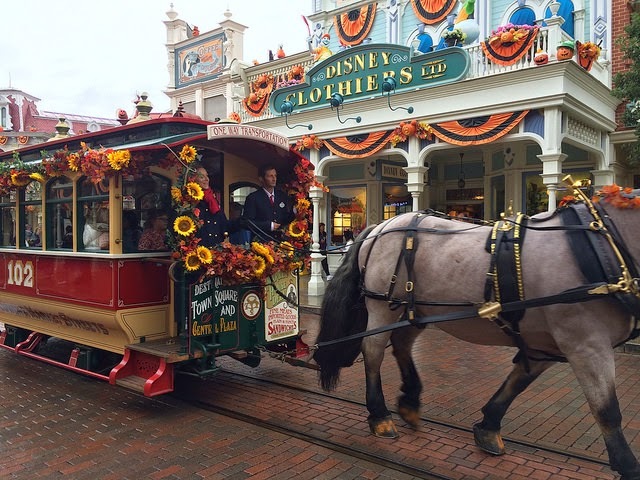 Even the horse-drawn streetcars had a Halloween twist. 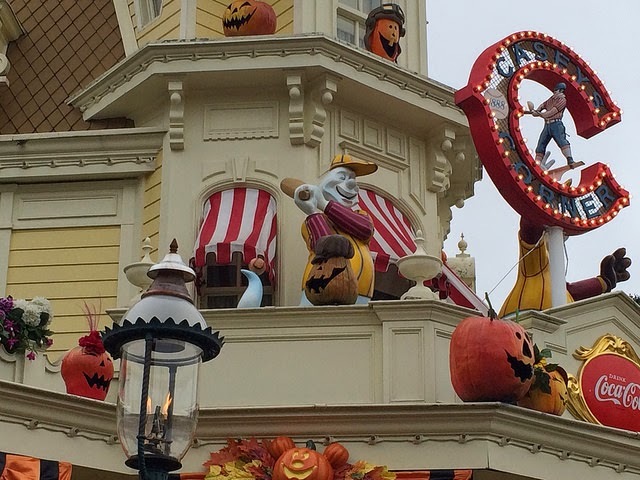 As you can see below, the rooftop of Casey's Corner features a ghost with a baseball bat, and you will find even more pumpkins along every inch of Main Street, USA. On top of Main Street motors you will see a ghost with a tyre, and another eating ice cream on top of Gibson Girl. 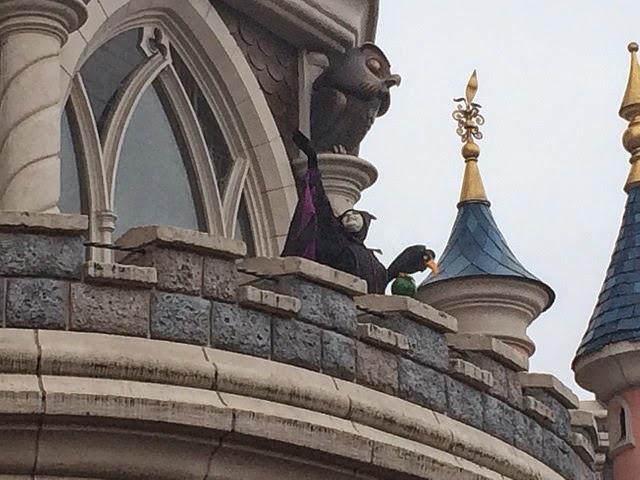 And then Maleficent came along on her float and directed the villains as they did their promenade around central plaza. The whole promenade maybe took five minutes at the most and the villains then disappeared. Admittedly, it was a bit of an odd way to introduce the Halloween celebration. 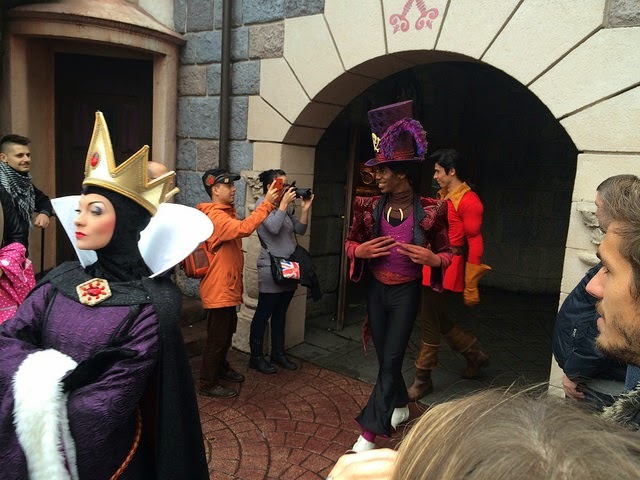 After this, we started hunting for the characters as most of the Halloween entertainment is composed of meet-and-greets. 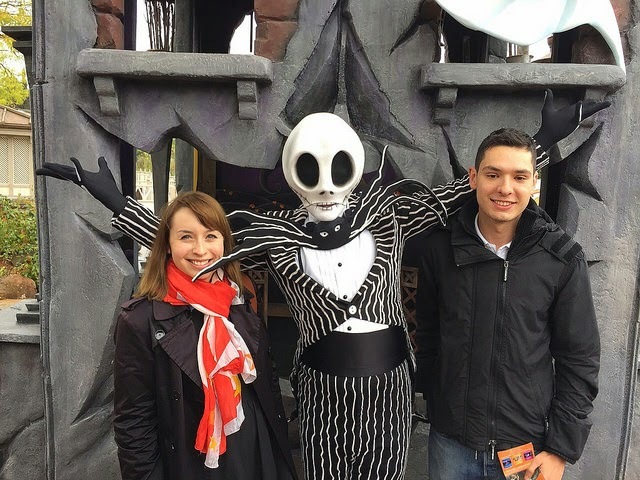 I am not typically a character hunter and in fact I find that taking photos with characters can actually be rather awkward but I had always wanted a photo with Jack from the Nightmare Before Christmas, and that is exactly where we went next. 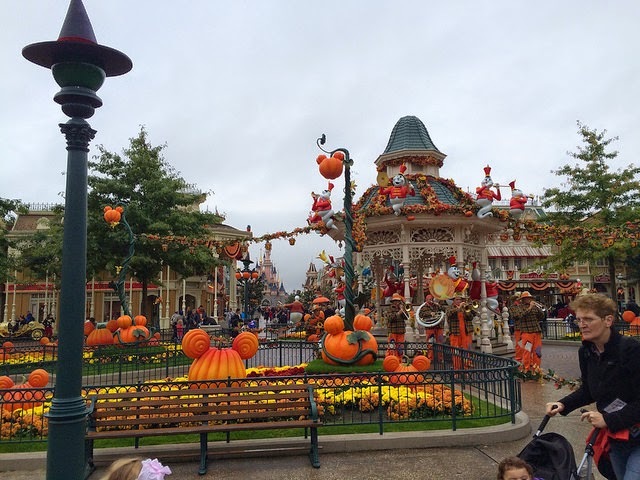 Before, leaving Central Plaza I had the chance to take some nice photos of the pumpkins in the area. 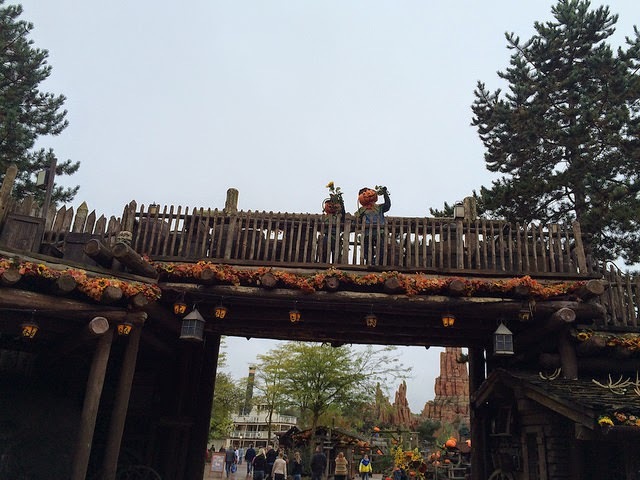 Then, it was time to go through the Frontierland fort and venture towards Jack. 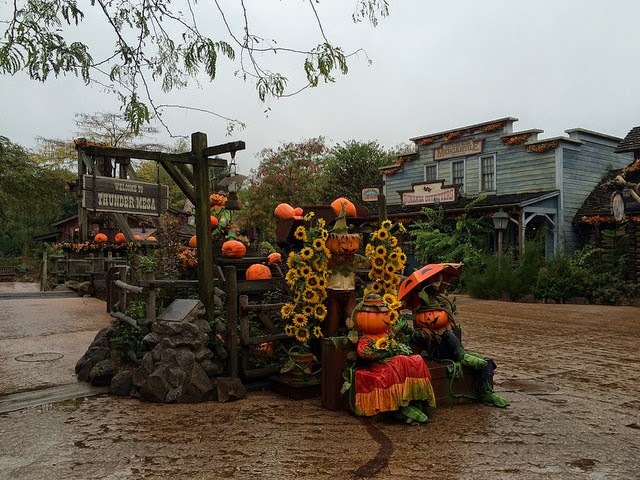 Frontierland is themed as well, if not better, than Main Street USA with pumpkins abound, as well as scarecrows everywhere. 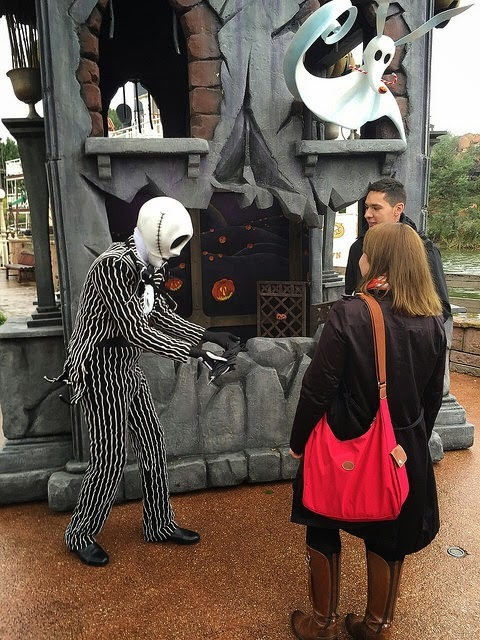 Located between Phantom Manor and Big Thunder Mountain, is the photolocation for Jack and Sally. 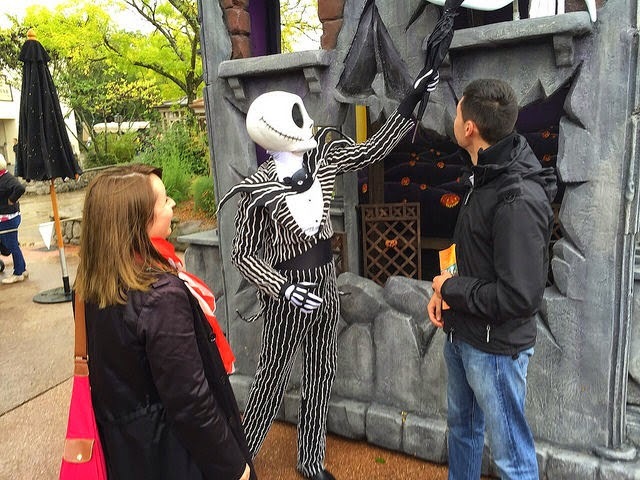 Unfortunately, Sally wasn’t meeting guests on this day but Jack was still there. I counted the groups ahead of us and there were 10 groups, so approximately a 10-minute wait. We got in line and about 10 minutes later we were chatting to Jack. It was really good to talk to a face character as it is much less awkward than the fur characters which do not talk in my opinion. As soon as we said “Hi” to Jack, he took an interest in my black umbrella and began asking “What’s this?” just like in the film. He was determined to find out what it did, was it a decoration? Could it fly? After two attempts and dropping my umbrella to the ground, and even (accidentally) damaging a bit of his photolocation, he finally gave it back to me. It was really good as he took the time to chat to us even though we were adults and it made for a fun couple of minutes. And voilà - the photo! After we got our photos with Jack, it was the end of his set so he went to quickly search for some Christmas presents for five minutes after we left. He was so in character which was great and he even walked off in a bizarre manner, just like he walks in the film! After that – it was time for a quick tour on Phantom Manor (5 minutes posted) followed by Big Thunder Mountain (15 minutes posted). 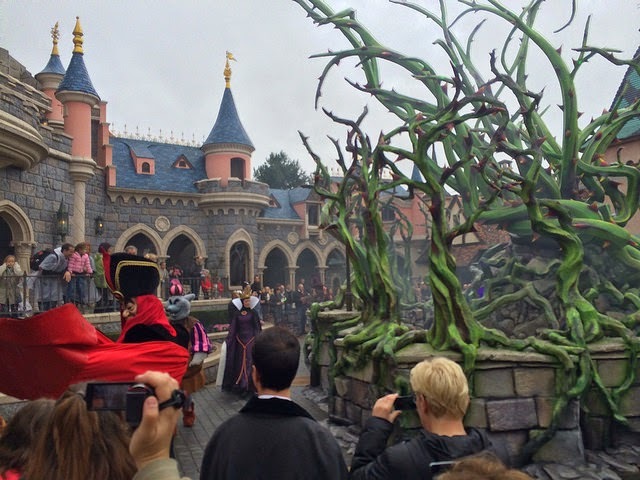 Then, it was time to visit the castle courtyard behind Sleeping Beauty Castle which had been transformed in Maleficent’s Court for Halloween. 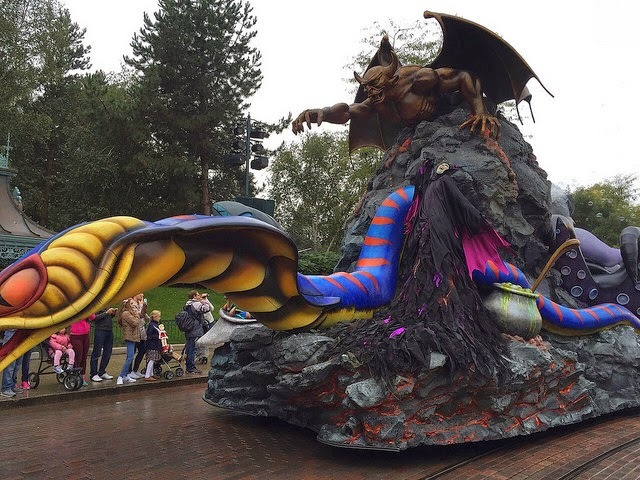 Just as we arrived, and began to admire the great brambles that had been installed in the area, we saw smoke above us and Maleficent came out to greet her guests. 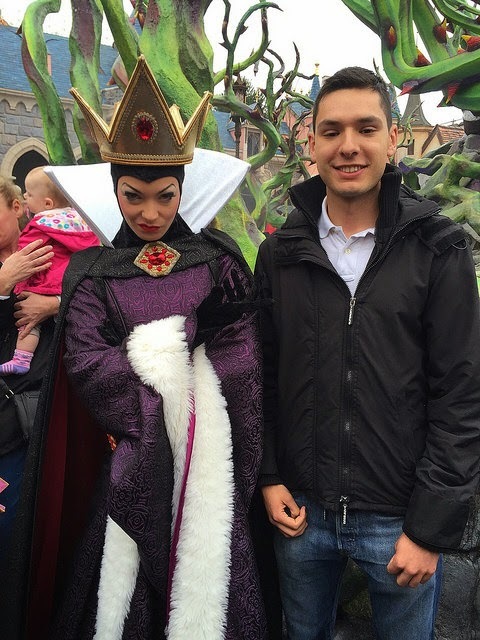 After a brief speech, she was gone and her villains began to appear all around us for photos. 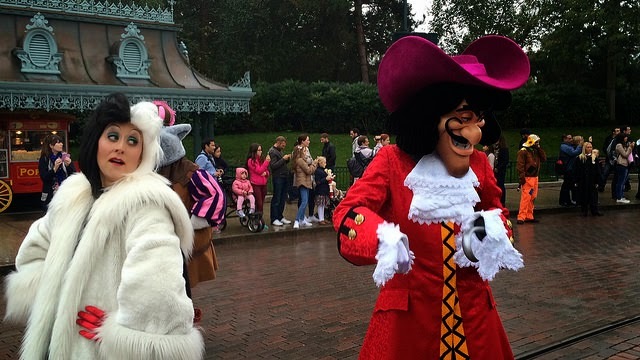 This was the big photo meet and greet of the season and several characters came out to play. 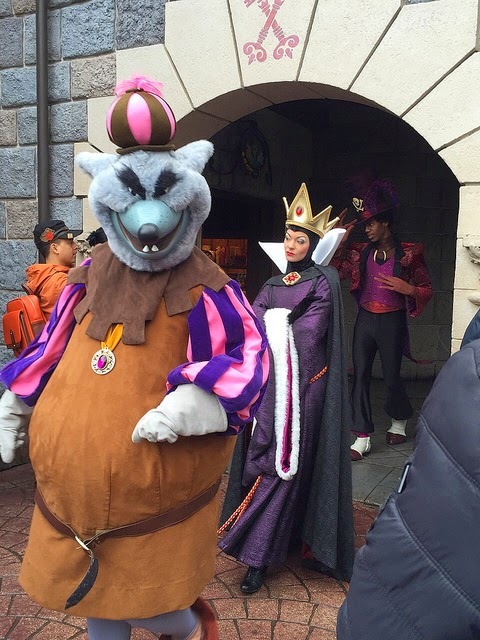 The villains come out to play! 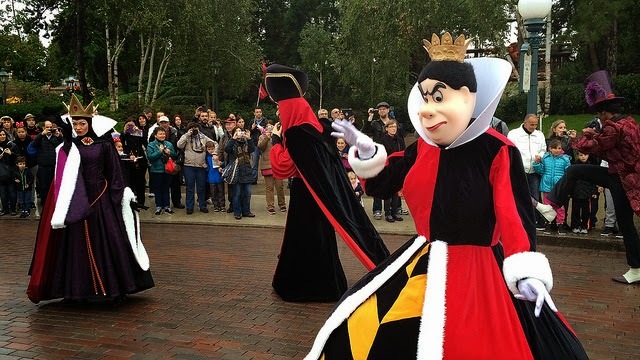 Unfortunately, unlike most other meet and greets nowadays here there were no formal queue lines and instead it was up to the characters to pick who would get the next photo. The characters were for the most part very fair and went around in a semi-circle fashion. In front of us as we arrived was the Evil Snow Queen who did a particularly good job of being in character all the time asking “What do you want? !” to guests and telling kids to move when they tried to skip their turn. She was hilarious and I really enjoyed watching her as we waited our turn patiently. It is really interesting too to see the characters switch from one language to another - we as Cast Members do it all the time but it was interesting to see. 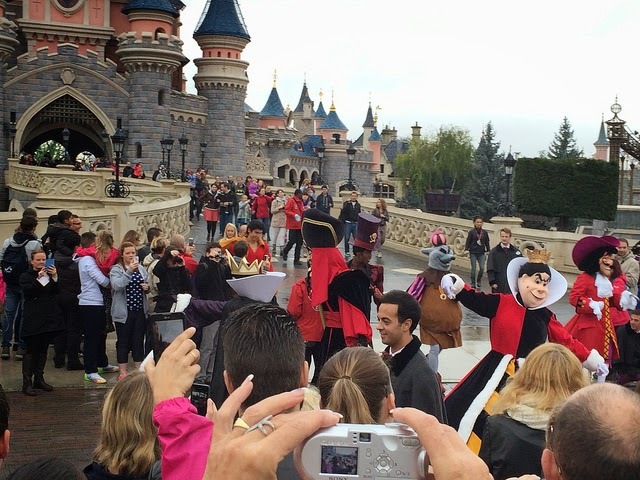 The majority of guests this day were French so the characters mainly stuck to that. 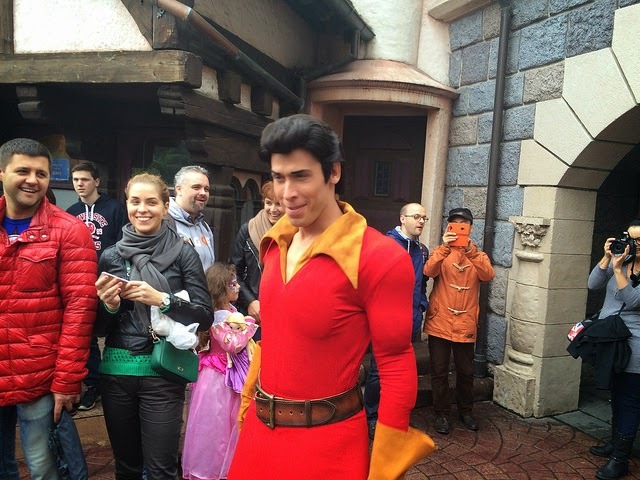 After our photo with the Snow Queen, Margaux got a photo with Gaston who had a new costume – his voice was great and he acted perfectly in character but unfortunately the Gaston we had on that day was skinny and the fake muscles in his costume looked terrible on him. It was a shame. No one else seemed to mind, but having seen some of the others I was a bit disappointed that this one didn’t look at all like Gaston even if he acted like him. 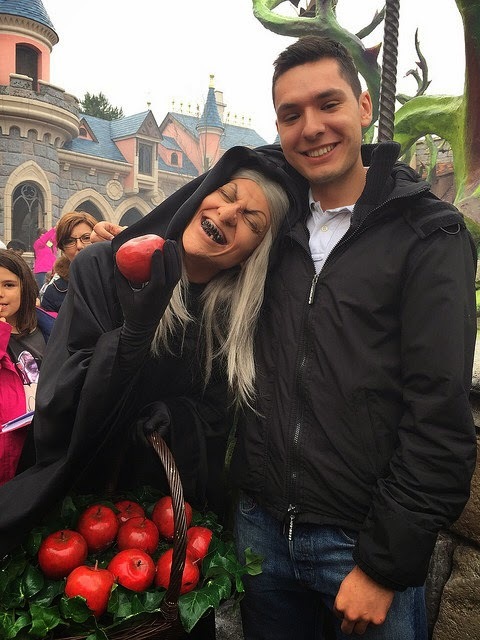 The characters were around for 30 minutes and then switched with others, and the second time round we got some photos with the Old Hag who was really very good – and was the most in character out of anyone I saw all day. She mocked people and scared people as she went around. Unfortunately, she didn’t seem to have a system for picking people but she was the funniest of all and was incredibly in character. We even had a small chat about me wanting to keep her apple. She wasn’t impressed. 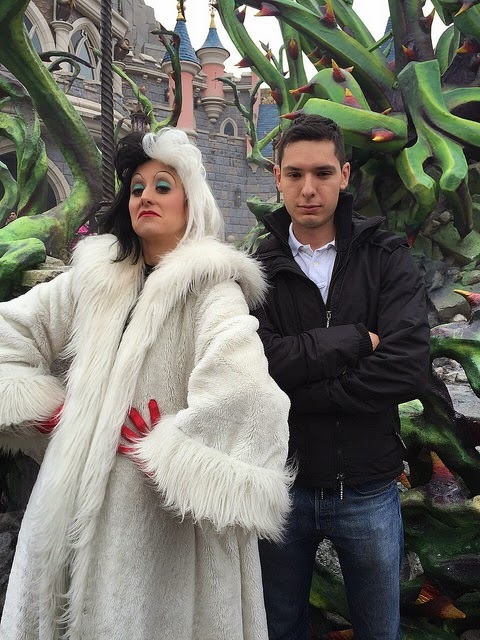 Cruella de Ville was also there who was fabulously in character too. I can't really fault any of the characters really. They were great. 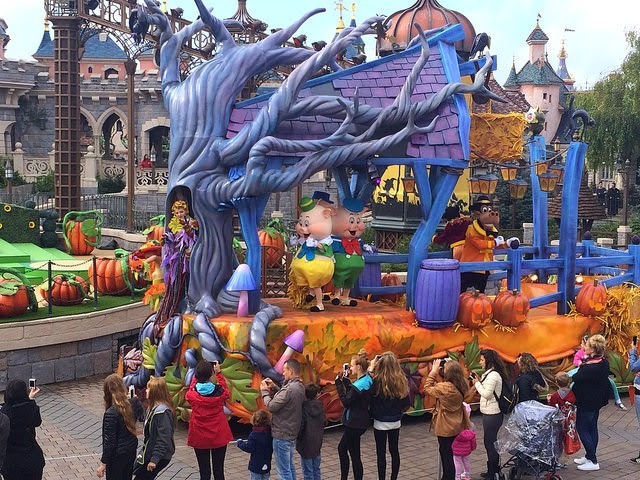 There were also Cast Members in the area giving out small bags of sweets as the Halloween treats are sponsored (and provided free to guests) by Haribo - a nice touch. Throughout the day we rode Pirates of the Caribbean (the ride is in incredible shape after its recent refurb and had lots of effects I had never seen working), Snow White’s Scary Adventures, Peter Pan’s Flight, Orbitron, Space Mountain: Mission 2, and we watched Captain EO which was great to watch after having not seen it for a year! 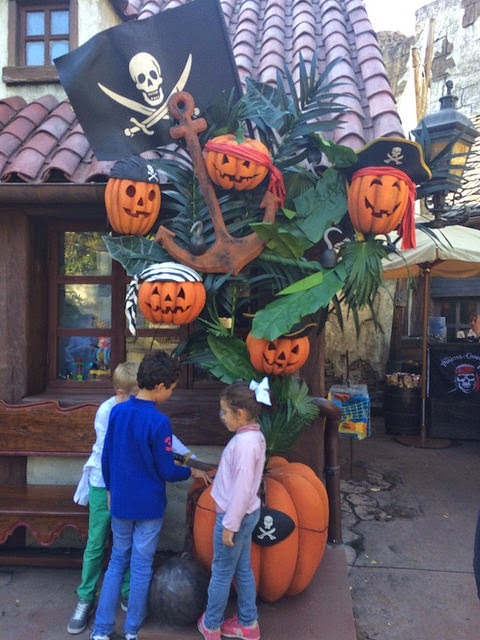 The only Halloween prop in Adventureland. Great theming though! 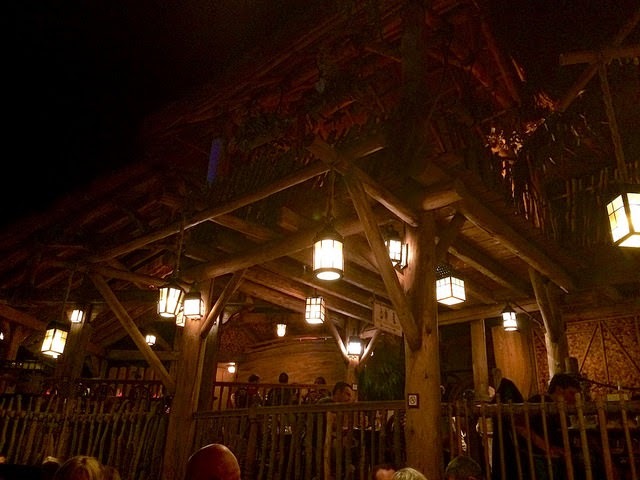 We also ate at the Blue Lagoon restaurant which is inside the Pirates of the Caribbean ride. I had already eaten at the restaurant in Disneyland in California and was disappointed – here the restaurant really lived up to its image. 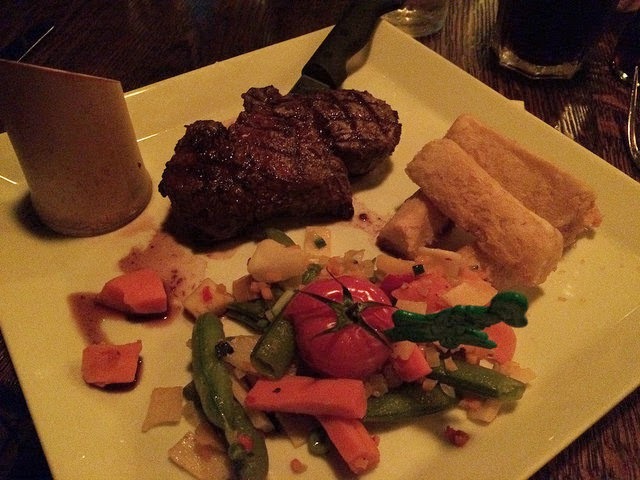 I had a steak which was cooked to perfection, the service was great and the atmosphere inside was ten times better at Disneyland Paris than at Disneyland. Even the lighting, decor and bathrooms were better here, and I particularly liked the touch of a bamboo cup for my steak sauce. 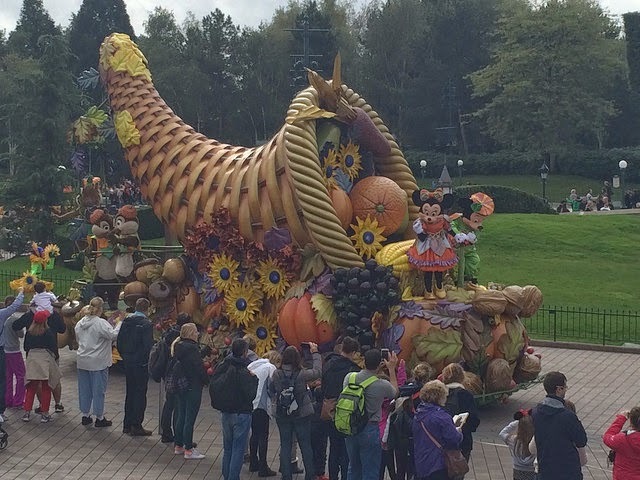 We also watched the Halloween Cavalcade which has a great song ‘Vive la Vie’ and is short at only 5 minutes long but definitely worth a watch. It will be expanded over the coming years but it was worth watching it. The new float added for 2014. There were no crowds for the cavalcade or the rides really and the longest we waited was about 10 or 15 minutes all day. Only the characters had longer queues. 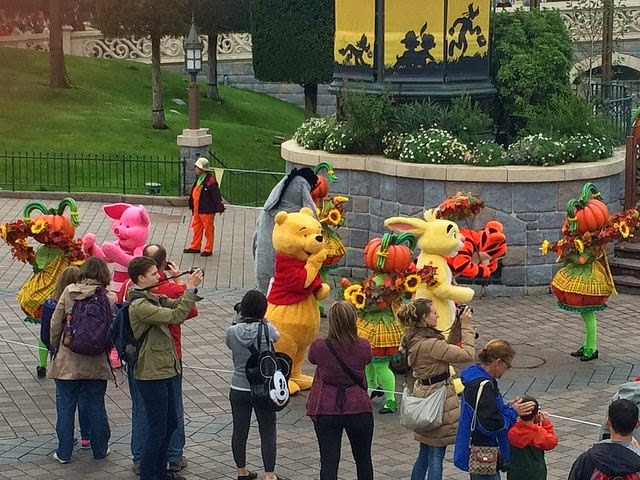 To be fair we didn’t see everything at the event and we did skip some characters – we didn’t get a photo with Goofy and his Candy Co, Minnie or Stitch at the Costume Couture, or Winnie the Pooh in his Halloween finest but we saw all of the characters from a distance as we went past. 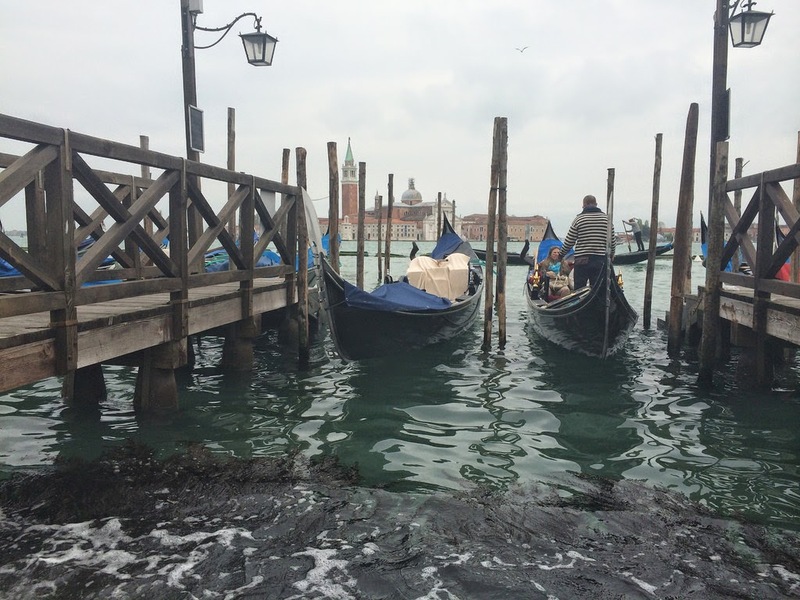 We were only there for a few hours though and we were thorough impressed. To finish off the day we hopped over to the studios to finish our day of spookiness with a ride on The Twilight Zone: Tower of Terror. All in all, a fantastic day out. 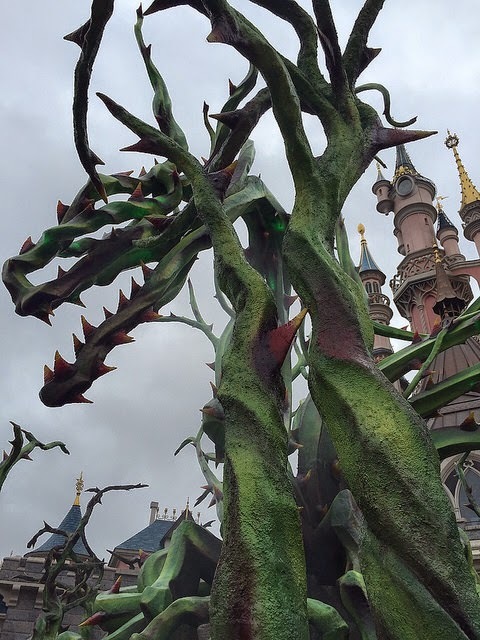 Previous Post: Working at Disneyland Paris - Day 71 to Day 126 - Summer is over!